On two years of the Narendra Modi government, the food ministry has lowered the prices at which it allocates wheat and rice for the mid-day meal programme and the Integrated Child Development Scheme. Both mid-day meal and ICDS are government welfare programmes. 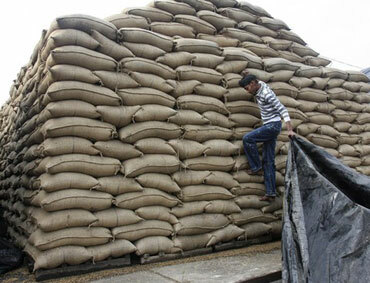 Presently, wheat for these programmes is allocated at Rs 4.15 per kg (kilogram), while rice is given at Rs 5.65 per kg. Wheat will be now be sold to the schemes at Rs 2 per kg, while rice would be given at Rs 3 per kg, the same rate at which it is sold to BPL (below poverty line) families under the National Food Security Act. In 2015-16, the Centre provided three million tonnes (mt) of wheat and rice to both these schemes, with the larger chunk -- 2.37 mt -- being lifted by the mid-day meal scheme. This incurs an annual subsidy of Rs 2,800 crore (Rs 28 billion) for these programmes, which is a part of annual food subsidy. By 2016-17 Budget estimates, the cost of rice for the Centre is Rs 33 per kg, and for wheat is Rs 24 per kg. Though the Centre bears over 90 per cent of the subsidy on these items, states claim all credit by providing the grains free to the poorest of the poor. "To ensure no one else takes credit, we are thinking of selling the grains for free," a senior food ministry official said.